Duncan Neville, editor-proprietor of the Francombe and Salter Mercury, is struggling to keep the paper afloat. For over 150 years, it has served the residents of the two South Coast resorts. Hit by the Recession and the advent of new technology, both the paper and the values it represents are under threat. Duncan’s personal life is in similar disarray, as he juggles the demands of his elderly mother, disaffected son, harassed ex-wife and doting secretary. Meanwhile, Geoffrey Weedon, a childhood friend turned bitter rival unveils a plan to rebuild the dilapidated pier, which, while promising to revive the town’s fortunes, threatens its traditional ethos. 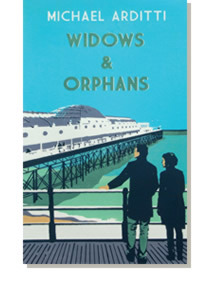 Lyrical and witty, moving and profound, Widows and Orphans turns a penetrating gaze on life in modern seaside town and paints a compelling portrait of a good man fighting for his principles in a hostile world.